The founder of Blackwater offers the gripping, previously untold story of the world's most controversial military contractor. "Hundreds of American citizens employed by private military contractors, or PMCs, would lose their lives helping our government wage wars in Afghanistan and Iraq, only to have their memory tarnished by the unfair and/or ignorant depiction of PMCs as profiteers, jackbooted thugs, or worse." Because of the secrecy requirements of Blackwater's contracts with the Pentagon, the State Department, and the CIA, Prince was unable to speak out when his company's opponents spread false information. But now he's free to tell the often shocking story of Blackwater's rise and fall. Blackwater hired Special Forces veterans and others with the skills and courage to take on the riskiest security jobs in the world. As its reputation grew, demand for its services escalated. Its men eventually completed nearly 100,000 missions in Iraq and Afghanistan. Prince's narrative includes newly revealed details about many controversial events. It debunks myths that have been spread by TV shows and movies. It honors our armed forces while challenging the Pentagon's top leadership. Above all, it will make people rethink exactly who the "good guys" and "bad guys" have been since 9/11. If you could sum up Civilian Warriors in three words, what would they be? Good narrator! I had to check several times to make sure Prince himself was not reading this book. Gurner gave a great performance and took ownership of Prince's voice. I have done 3 tours in Afghanistan and worked with all kinds of civilian contractors. I had an opinion of them ( I am not going to tell you if it was good or bad). After reading this book it gave me a good view of the otherside of the coin. In his book, Prince gave several accounts that one could piece together with a little research and learn all about the facts of the situation. I believe the men and women of Blackwater/Xe/Academi were one of the main reasons we as Americans had as few of casulaties in Iraq as we did (compairing it to other wars). 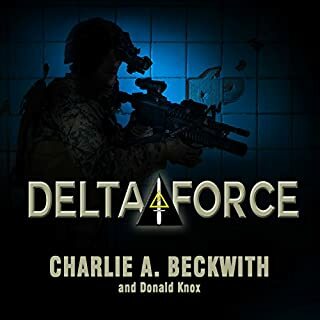 Whether you support the use of civilians as security personnel in combat situations or not this is a good book to read if you can keep an open mind. Once piece of advice if you are going to read this book. There are not always black and while rules in war....as much as I wish there were. Eventually there are times when things turn gray; and that is where the hard decisions are made. Interesting, Mr. Prince seems very educated, good story for the most lart. Alot of it seemed like a lot boasting, excuses, and finger pointing. 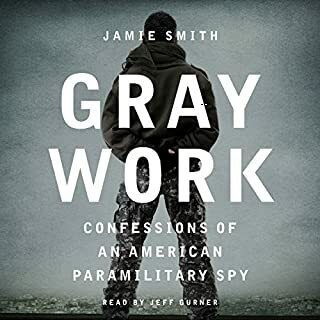 I enjoyed Gray work alot better. What did you love best about Civilian Warriors? It seemed like Erik Prince was very honest about his story. I liked the simple language, the simple truth and the simplicity of being down to earth. I just finished this audio edition and found it very interesting to hear the real side of the Blackwater story. The information is heavily referenced to validate the authenticity. In fact it is bold that Erik Prince mentions that in certain areas he was not allowed to talk about because of a Non-Disclosure agreement, he uses another person's first-hand account (not bound by the NDA) to fill in the missing information. With the recent disgruntlement of the ROE in Afghanistan, and the 2012 Libyan murder of our Ambassador, I wonder how the public would react today versus 2007? If you could give Civilian Warriors a new subtitle, what would it be? I enjoyed listening to this book very much. The information was quite informative. I am not someone who knows a lot about the mechanics of war. I have started becoming involved with learning about wars within the past year. Since then I have listened to quite a few books, both fiction and nonfiction. My interest continues. Absorbing the information given about Blackwater by Erik Prince provided answers to quite a few questions I had that had no answers. Learning how private sources intervene and insert themselves into areas around the world where conflict is occurring and what these men and women are asked to do and do it, was fascinating to me. 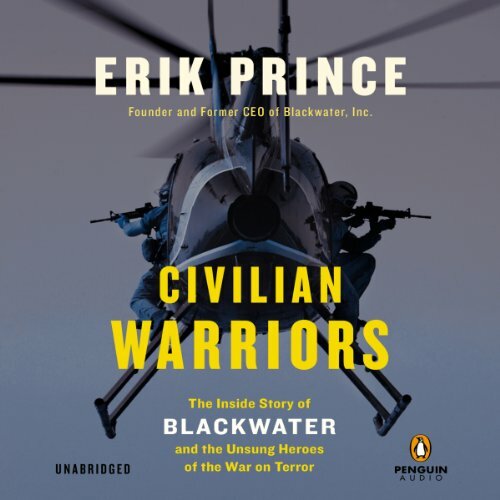 Erik Prince's involvement with wars through his company known as Blackwater, was well worth my listen. I realize that Prince was not blameless in all of his men's interactions while in Iraq and Afghanistan or any other place they may have been involeded but the services Blackwater did provide would have been done whether by Blackwater or another such organization. People do react differently when they believe that there is a threat to himself and his men. Participants who join these private companies have their own reasons for participating. Their jobs are required and if what needs to be accomplished by private companies not fighting in the war itself and it's the US government wanting their services, payment comes from whom required their services, which was, at times, the US government itself. Understand that these facts provided in the book were quite new to me and I listened with rapt attention. The book about Blackwater has opened my mind to see inside the kaleidoscope of war. The narrator was excellent. I'm sure that he was a critical part of why I was able to listen to this book. Even when he was providing statistics, I listened. The credit I used to purchase this book was well worth it. Listen to this book and come away with your own evaluation of its truth or untruths. Either way, it's a well worth read. “Civilian Warriors” is a spirited defense by Eric Prince of his company and himself. But do not let that turn you off from reading this most interesting and exciting story with lots of information for entrepreneurs on how to start and grow a company on a shoestring is a person sees a marketing niche. Prince tells about his early life in Michigan and his time at Annapolis and his time in the Navy SEALs. 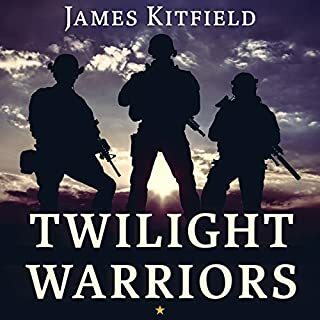 He also provides the history of the American military use of civilian warriors from the time of General George Washington to the current time. I found this discourse most interesting. Prince goes on to describe how and why he started Blackwater to have a complete and diverse training facility all in one location to train Military, law enforcement, and civilian guards and bodyguards. Prince goes on to explain how he was contacted by DOD and the State Department to provide protection for American Diplomats and military bases. Prince also notes that Blackwater never lost a person they protected. 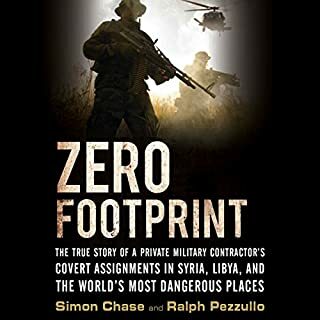 The second half of the book goes into the backlash from Congress about the hiring of civilian contractors that were beginning to match one for one the number of military personnel in the war zones. Prince does admit to making mistakes but also goes on to show how he and his company were scapegoats for providing to the government the services they could not supply themselves. The book is well worth the read and is written in an informative and exciting way. 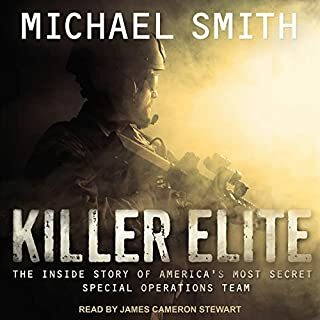 Jeff Garner did an excellent job narrating the book. 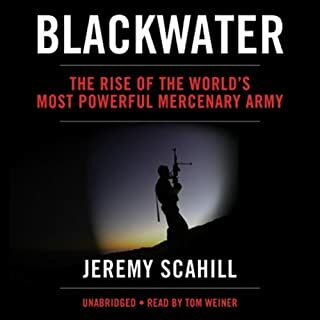 Covers the history of Blackwater and how it was started, to every event involving BW you've ever heard of and many you have not (good and bad) to the inner details of how BW operated, the rules it operated under, the bad press, the investigations and the witch hunts. Best part is everything is backed by verifiable facts, not just wild speculation and conspiracy paranoia. This is really not a book but an infomercial, but in any case it is an edifying and remarkable story about some extremely violent business without the trace of any cause, except for business itself. Erik Prince provides mercenaries as government subcontractors, some type of uberized warriors, or like some prostitutes to be disposed off after they get a little too old or can't do their usual push-ups any longer. He sees nothing wrong with it because of the bureaucratic nature of the regular military: if you "privatize" everything works fine! as history has proven repeatedly completely wrong, but as the media (owned by the wealthy) is relentlessly telling us the opposite. Taking advantage of former and weathered soldiers from the government, he offers them a generous amount of money to be involved in a war zone. If they get maimed, too bad, and if they are lucky they might be eligible for Medicaid, that Prince as a hard line Republican wants to eradicate anyway. The funny part is that he denounces the other companies involved in the same business but not as "good" as his. Maybe he should try providing something else with some human face and soul. What made the experience of listening to Civilian Warriors the most enjoyable? understood the real value of these civilian warriors. This book reveals the bright side of Blackwater and fully understood. Would you listen to Civilian Warriors again? Why? Absolutely, I've listened to several chapters more than once. I have business partners and several colleagues who have worked with Mr. Prince in the past. Their stories mirror the descriptions provided in this book and add credible details. If you were to base all of your opinions about Blackwater and Erik Prince on the media, you would be sorely mistaken. It's an excellent, and long overdue, insight into an often misunderstood and misaligned industry. A great revealing book providing a different perspective on what happened in the Blackwater story. Well written and good narration. An interesting account of the post 9/11 world. And sheds a light into the future of contractors and the government. great. interesting. the truth about blackwater. Inciteful, interesting and mesmerising. The truth about Blackwater. Erik Prince is a great man, hounded for being Brilliant. what a team with such a wonderful ethos he created. What was one of the most memorable moments of Civilian Warriors? Would you consider the audio edition of Civilian Warriors to be better than the print version? I loved the steady growth of the Blackwater company and how it relates to world events. He reads this perfectly. Right tone and pacing. Superb. The death of Blackwater contractors and the effects on the family. Wonderful book from an insiders point of view. Clearly the opinions of PMC is a grey area and this is very biased towards the positives. However it's very well written and read and shows the progression and need for such organisations. Mr Price for his faults, really understands his subject. And that comes across. This book really opened my eyes to what was going on in the war, and gave some good context to what is happening in the region today. It was a big mess, the whole affair, and it helps to shed light on what made it a mess, how and why. Albeit the vein the book is written in is from the contracting profession, which is both limiting in some aspects and throws the curtains wide in others. It should also be noted the authors political leanings and attitudes, especially toward business, show he just wanted to do the best job at the cheapest rate in order to provide excellent service. All of these entrepreneurial qualities are what make countries and businessmen a big pillar in any society. It's unfortunate his customers were a government body, who in the end only used him and his company as political capital to shield themselves from public outcry. All in all it's a fascinating read and serves as an excellent warning about war, politics, business and the nature of governments. It was good to hear the other side of the story rather than just the media's version of events. Very enjoyable and well written.